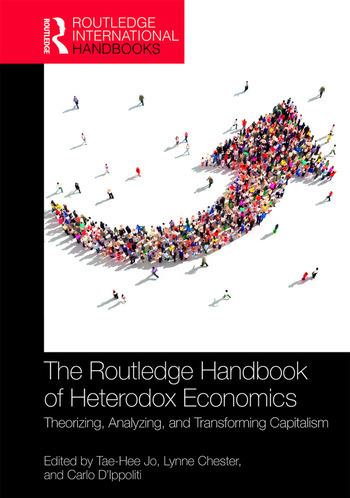 The Routledge Handbook of Heterodox Economics presents a comprehensive overview of the latest work on economic theory and policy from a ‘pluralistic’ heterodox perspective. Contributions throughout the Handbook explore different theoretical perspectives including: Marxian-radical political economics; Post Keynesian-Sraffian economics; institutionalist-evolutionary economics; feminist economics; social economics; Régulation theory; the Social Structure of Accumulation approach; and ecological economics. They explain the structural properties and dynamics of capitalism, as well as propose economic and social policies for the benefit of the majority of the population. This book aims, firstly, to provide realistic and coherent theoretical frameworks to understand the capitalist economy in a constructive and forward-looking manner. Secondly, it delineates the future directions, as well as the current state, of heterodox economics, and then provides both ‘heat and light’ on controversial issues, drawing out the commonalities and differences among different heterodox economic approaches. The volume also envisions transformative economic and social policies for the majority of the population and explains why economics is, and should be treated as, a social science. This Handbook will be of compelling interest to those, including students, who wish to learn about alternative economic theories and policies that are rarely found in conventional economics textbooks or discussed in the mainstream media, and to critical economists and other social scientists who are concerned with analyzing pressing socio-economic issues. Tae-Hee Jo is Associate Professor in the Economics and Finance Department at The State University of New York–Buffalo State, USA, and a former Editor of the Heterodox Economics Newsletter (2009–13). He has been working on heterodox microeconomic theory from institutionalist, Marxian, and Post Keynesian perspectives. Lynne Chester is Associate Professor in the University of Sydney’s Department of Political Economy, Australia. She is recognized as a leading Australian scholar in the empirical application of Régulation theory. Her research focuses on a range of energy issues (affordability, security, markets, price formation, the environment) and the policy responses of capitalist economies through different institutional forms. Carlo D’Ippoliti is Associate Professor of Economics at Sapienza University of Rome, Italy. He is the editor of PSL Quarterly Review and of Moneta e Credito, and his research focuses on the history of economic thought, feminist economics, and European political economy.